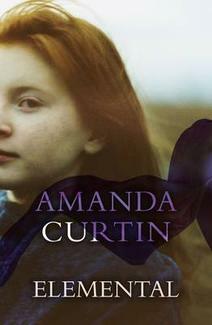 As you know if you saw the Sensational Snippet that I posted about Amanda Curtin’s new novel Elemental, I loved this book. Curtin is an author of exceptional talent and in this novel she tugs at the heartstrings without being maudlin, sentimental or twee. This is one of those novels that is at once both tender and brutal so that the reader becomes emotionally bound to the world that has been so skilfully created, not wanting to stop reading and yet not wanting the book ever to end. The central character Meggie Tulloch is a tough old lady who has lived through that cruellest of centuries, the 20th. In her old age, something is bothering her so profoundly that she is setting down the story of her life for her grand-daughter, Laura, whom she calls ‘lambsie’. Her memories are painful, and the reader feels the tension between the impulse to conceal and the will to reveal, a struggle that must be resolved in order for Meggie to explain herself and her family, for some reason that is not revealed until the end of the story. She was born near the turn of the century in the north-east of Scotland when economics meant that unskilled labourers worked in atrocious conditions. The men work hard, but the women’s lives are a misery. A man comes home from the boats to a meal by the fire and a chance to rest a while, but the women’s burdens are Sisyphean. They lug creels of fish for sale across the bitter landscape, and it is they who must wade into the freezing sea – to hoist their menfolk into the boats so that their feet stay dry during the long hours at sea. Girls take on responsibility early: cooking, cleaning, endlessly knitting with frozen fingers the clothes that protect the men from the harsh winds and water. What education there is, finishes early, even for a bright girl like Meggie, because superstition and tradition rule, with each succeeding generation bound to the same hopeless existence. But change does come, in the form of herring boats from the North Sea and industrial scale processing. Like her sister Kitta, Meggie takes the opportunity to escape, though not without guilt at abandoning her mother. But it’s a workplace to rival the horrors of the Chicago abattoirs in Upton Sinclair’s The Jungle. Meggie works outdoors, in foul weather, gutting fish for hours on end and destroying her hands with the salt – and yet glad to have a job and be independent of her sadistic grandfather. She falls in love but marries mainly to rescue her sister from the madhouses that were no help to the mentally ill at the turn of the century. Both Meggie and her husband suffer work-related injuries and the skills they’ve learned are damaged along with their bodies. So they emigrate, to Fremantle WA, but along comes The Great War, and then another, and both bring tragedy in different ways. There’s a pattern slowly revealed, an impulse that seems to run through the generations, that Meggie is desperate to warn Laura about. I’m not going to mess up the cunning structure of this novel by giving any hints about the Coda, which follows Water, Air and Earth, except to say that Meggie’s voice which narrates the first three parts is so strong and authentic that it’s a disorientating shock when the narration shifts. In a world of plastics, processed food, synthetic environments and virtual communications, the world of Meggie Tulloch is raw and profoundly confronting. It seems as if the author is challenging readers of the 21st century to consider how we might endure in a world grown soft with indulgence. Meggie’s life is grim, but it is better than her mother’s, she thinks, and it has never soured her. Indeed it pleases her that her granddaughter’s life is so benign that it seems shallow. It is not until the Coda that Curtin shows with graphic realism that the 21st century can dish out a grim reality requiring courage and endurance too. Destined for the shortlists, I am sure! Or direct from UWAP (where you can also read another extract, and there is a reading group guide). I really loved The Sinkings and this one sounds even better! ahh, it’s seems a long way off reaching book depository – released only a few months ago. Shall have to wait! Yes, I know exactly what you mean. I can’t bear reading on an iPad, and I don’t like the Kindle either – but I do use it when I really want something and I can’t get it quickly any other way. It’s also useful for old out-of-print books from Project Gutenberg. Yes an e reader is looking awfully like a needs must… With no library here its just not practical to buy everything in print. Especially now all the kids are reading too… But I’m loathe to put yet ANOTHER screen in front of the kids, or even let them observe me on another one too (im always on my phone as it is) There seems to be No escaping the bind of technology (and that’s that I find the ability to highlight text on the kindle/iPad so useful, and search within the text so much Fun, and i can take notes… And audiobooks as well…). But still. But still. ‘At once both tender and brutal’ – a perfect description. I’m so pleased you liked this Lisa, I think it is a fantastic book and I too hope to see it on the shortlists. Thanks Lisa. Your recommendations have once again led me to gem – as yet unsung. I thought the sections set in Scotland were just brilliant – such a vivid description of a place and time and all in a voice that was so strong and distinct. How can it be that this has garnered zero positive press!!? Robin, the way this book has been overlooked has been a complete mystery to me. It should be on international bestseller lists! What we must do as readers is to spread the word so that it gets the recognition and the all-important sales that it deserves. Robin and Lisa: a lovely friend just sent me this link. Please know that your comments have made my day. Thank you! I love your writing Amanda, I bless the day that I stumbled across The SInkings at the library and discovered you! Beautiful review, Lisa, and so true. Elemental is a stunning novel. I just loved it! Please, tell everyone you know, it’s a book that deserves to be more well-known than it is. I’m trying, Lisa. I’m trying! I’ve given Elemental as a birthday gift throughout the year – and telling every other person to read Elemental! And I totally agree with you, this is a novel that deserves to be more well-known than it is. And laden with awards, I might add. Good-o! So we will be two-woman marketing campaign for this book and *make* everyone sit up and take notice of it! Thanks Lisa for the heads up about this book! It will work great for the Read Scotland Challenge Looking forward to reading it. On’ya! Lisa. I’m sure, given enough time, that they’ll be reading Elemental around the globe.